So this past week I had to do a progress report for my classmates and the faculty here at CCS and part of that report had me breaking down and explaining my process. The next round of posts here on this blog will be me elaborating on what I said. My advisor's feedback is great and we spend a lot of time fine-tuning the script trying to get it so that all the points I'm trying to get across are really clear. In fact, we're still working on some parts of Chapter One even though I'm starting to work on Chapter Two as well. I do my thumbnails in two parts. 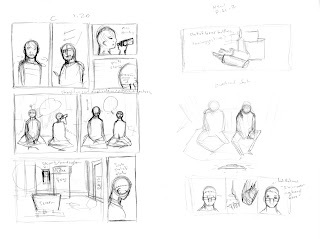 First, I do a set of small thumbnails that is pretty much just panels. 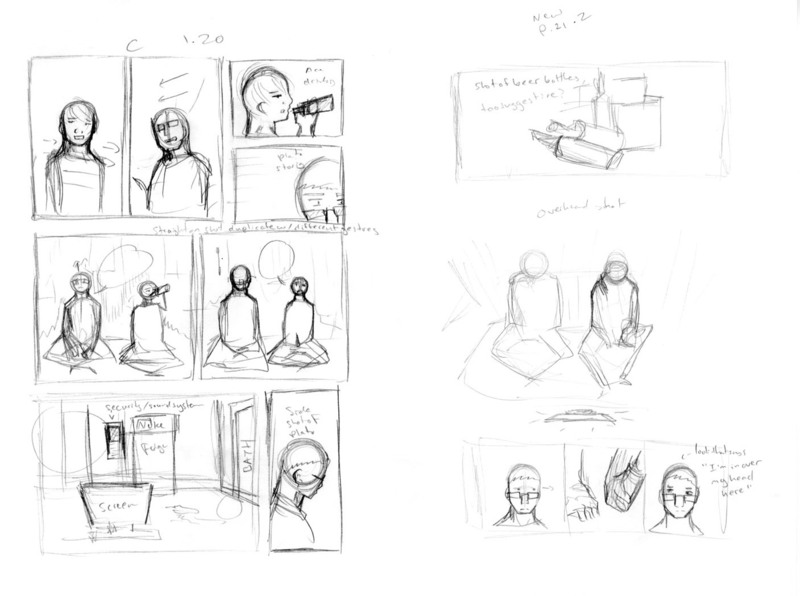 I do this so I have a sense of how the pages look altogether and so that the layouts themselves aren’t too repetitive. After that, I do my final thumbs at something like, 1/2-1/3 scale on halves of 8.5x11 paper in spreads where I knock in the details and start to see how it’ll really look. This is about the most readable my thumbs get. They're not always this clear, but I tend to make them fairly readable. I will photocopy enlarge certain thumbs and lightbox those for pencils sometimes. Anyway, that's just the first steps to working out a page. I like having all my writing just about done before I start working out pages. I like getting things as polished as possible, which since we'll be covering pencils next time, I'll be able to elaborate on even more.